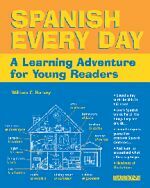 Designed for the younger learners of Spanish, this manual helps them develop basic informal language skills. The structure follows a day in the lives of children, starting as they wake up in the morning and finishing at bedtime. Through more than 400 cartoon-style illustrations they will be guided through the house and learn new words and phrases related to topics including toys, clothing, numbers, names of family members, rooms, furniture, and more. Outdoors and down the street, they discover words for workers, cars, trucks and buses, while at school they explore Spanish words for objects in the playground and classroom. The cassette follows the book's story and helps students with pronunciation.